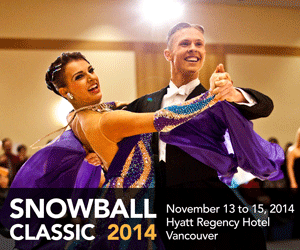 DanceSport BC is thrilled to announced that the 2016 SnowBall Classic will be held at the Hyatt Regency Hotel in Vancouver from November 12 to November 13, 2016. We will feature the WDSF Adult International Open Standard and Latin Championships, along with a full slate of competitions from Juvenile to Senior IV. Don’t miss your chance to see the world’s best dancers in Vancouver!